In 1967 a year after Wegner stopped designing for Carl Hansen & Son and the other Salesco group of companies he continued to work with Getama. The GE501 and the high back version GE501A are amongst a very few chairs Wegner designed using laminated sections combined with upholstery. The Chairs were showcased together with other furniture especially designed for the company. collection for Getama included the Hammock Chair. Wegner had experimented with laminated wood supporting the body with a web of woven flag halyard. A technique he had previously employed in his 1958 Web Chairs, (PP129). 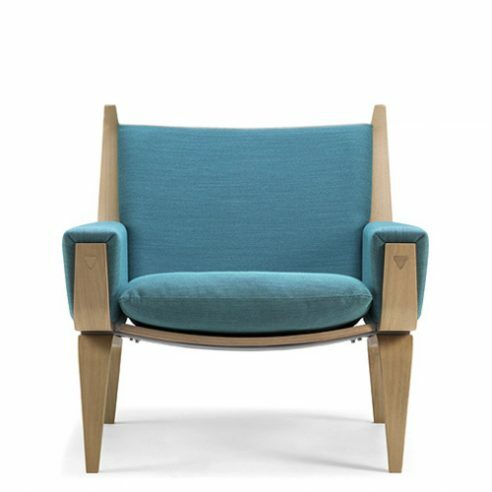 The Hammock Chair was relaunched in 2014 by PP Møbler as PP 135. A little more than six months later, in January 1968, PP135 helped Wegner on his way to winning the American International Design Award for his collective contribution to furniture design.